Sesame and steak! What could possibly be wrong with that? I’ll tell you what’s wrong: I forgot to add the sliced avocado, and it’s making me furious! This is a really good salad even without the avocado, and honestly I didn’t notice the lack of it until I saw the lonely avocado sitting on my kitchen counter the next day, but I MEANT for there to be avocado because it just makes so much sense! A good blogger probably would have re-shot the whole thing but, to be honest, photography is not my favorite part of this whole blog process. Cooking I love, writing is fine, but photos stress me out. So you get avocado-free photos and a really snarky post intro. But this is a delicious dish. 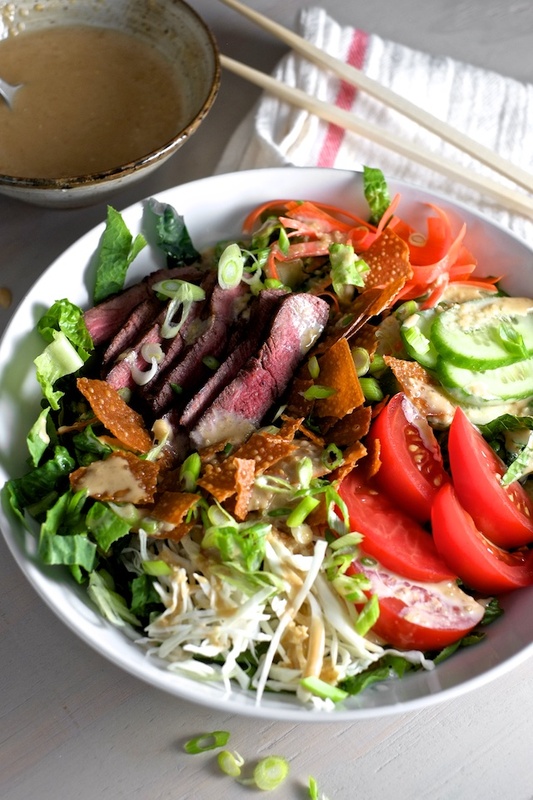 A healthy and satisfying meal in a bowl that works perfectly with that sesame dressing. I am proud of it. I will make it again. And next time I will not forget the avocado. If you have chopsticks in your house, you should use them. Salad is somehow easier to eat with chopsticks than with a fork. 1. Prep your dressing if necessary using this recipe (don’t worry it’s super easy). 2. Start by preheating your oven to 350F. On a baking sheet lay out your wonton wrappers and brush each side with oil (you’ll use about 1 Tbsp total). When the oven is preheated, bake the wonton wrappers for 15-20 minutes or until they are golden brown and crispy. Drain the baked wonton wrappers on paper towels, crush them up, and set aside. 3. Prep your steak for cooking by setting it on a plate a room temperature, adding generous salt and pepper to both sides, and coating the surface in the second tablespoon of neutral oil. Set the plate aside until you are ready to assemble your salads. 4. Slice and wash the kale, romaine, and cabbage and set aside (if you have a salad spinner, use it to dry the greens). 5. Peel the carrot and grate it or use peeler to create thin strips of carrot and cut them to the desired length. Slice cucumber, tomato, and scallions and set aside. 6. Lay romaine, kale and cabbage in your serving bowls. Pile cucumber, carrot, and tomato on top. 7. Preheat a nonstick or cast iron skillet over medium heat for about 3 minutes. When the pan is hot, lay your seasoned and oiled steak in the pan and let it sear until it’s brown and crusty on one side (about 3-4 minutes). Flip the steak and let it cook until you reach your desired doneness (read this here for more information about pan seared steak and here about temperatures). Remove the steak from the pan and let it rest on a cutting board. 8. While the steak rests, slice your very important avocado and divide it between the salads. 9. 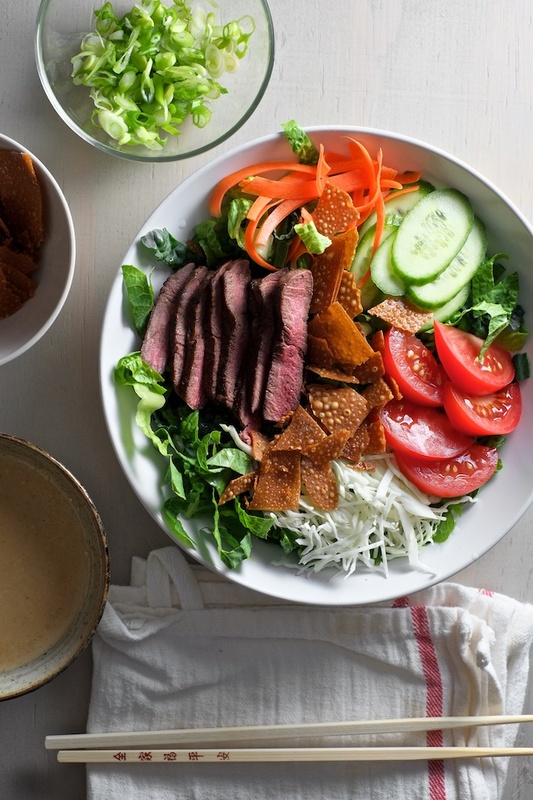 After the steak has rested for 5 minutes, slice it, divide it, and lay it on the salads. 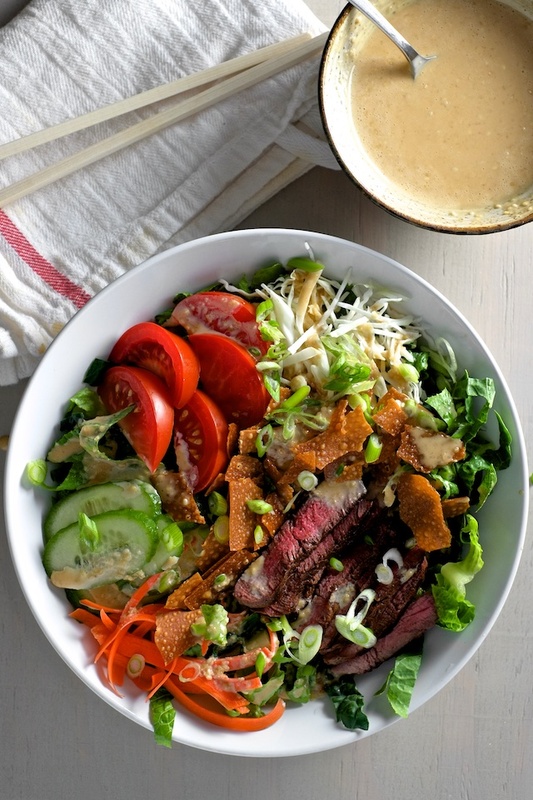 Top the salad with the sesame dressing, crushed wonton wrappers, and scallions. Serve immediately. Bahaha! But what are the holidays for if not playing cookie monster? Also, DON'T FORGET THE AVOCADO.